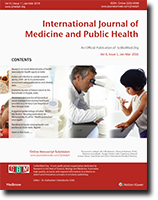 M. Gutch, Kumar, S. , Saran, S. , Gupta, K. Kumar, Razi, S. Mohd, and Philip, R. , “Prevalence of autoimmune disorders in pediatrics type-1 diabetes mellitus in western, Uttar Pradesh, India”, International Journal of Medicine and Public Health, vol. 5, no. 1, pp. 29-31, 2015. M. Gutch, Bhattacharya, A. , Kumar, S. , and Razi, S. Mohd, “Diabetic Ketoacidosis Unusual Presentation of Latent Autoimmune Diabetes of Adult (LADA)”, International Journal of Medicine and Public Health, vol. 7, no. 2, pp. 130-131, 2017. M. Gutch, Bhattacharya, A. , Kumar, S. , Pahan, R. Kumar, and Singh, R. Somedra, “Dapagliflozin Induced Pancreatitis”, International Journal of Medicine and Public Health, vol. 8, no. 1, pp. 45-47, 2018.